In our media-overloaded world, a spotlight is sometimes cast on the five-year-old reading Tolstoy, the twelve-year-old entering college, or the eight-year-old violin prodigy. We rightly identify them as gifted, but they certainly aren’t the only ones. The National Association for Gifted Children estimates 5-7% of the population is gifted and range from mildly gifted to profoundly gifted. To adequately provide education for gifted students, first gifted children must be identified. To identify giftedness, it must also be defined. There are many definitions of giftedness, which is one reason gifted education is so tricky a subject. Francis Galton, the first to use the term, viewed giftedness as extraordinary success in an area. Lewis Terman used it for people with IQ’s over 140, noting that a high IQ did not automatically lead to great success. Leta Hollingworth understood that gifted potential must be nurtured in school to create success. Joe Renzulli created a Venn diagram of gifted behavior that showed it as the convergence of Above Average Ability, Creativity, and Task Commitment. I tend to hold closest to Hollingworth’s definition. I see many people who are extremely gifted who never learned some of the other needed skills, such as how to work hard or how to succeed after failure. This is often a direct result of not being challenged in school, the precursor to the workplace. A life of ease in a system that is supposed to help one prepare to be college-ready, career-ready, and life-ready often leads to some form of failure in all three. It is only through overcoming obstacles that we can hone many of the essential skills needed for success. Therefore, I don’t consider extraordinary success as a necessary component of giftedness, but a possible indicator. One important thing to remember is that gifted children vary so much. There are gifted children who are ‘spirited’ and are overwhelming in their intensity and energy. There are gifted children who are ‘sensitive’ emotionally or physically and may easily have their feelings hurt or find certain articles of clothing painful to wear. Some gifted children appear to have Asperger’s as the traits of each can be similar. Some are gifted socially and are great leaders. Some excel in the classroom and are almost perfect students. Others become disruptive because they are bored. Do not rule out a child as gifted because they don’t behave like another gifted child. The role of a parent is vitally important in identifying gifted children. Barbara Kerr, a noted expert on giftedness, writes in her book ‘Smart girls: a new psychology of girls, women, and giftedness’, “In fact, my experience has been that parents who suspect their child is gifted are correct 99 percent of the time, making parental judgements one of the best assessments around.” Many experts believe IQ tests should not be used before age 5 and possibly not before age 9 as the results may not be accurate. That leaves much of the recognition of giftedness up to the parent and the teacher. 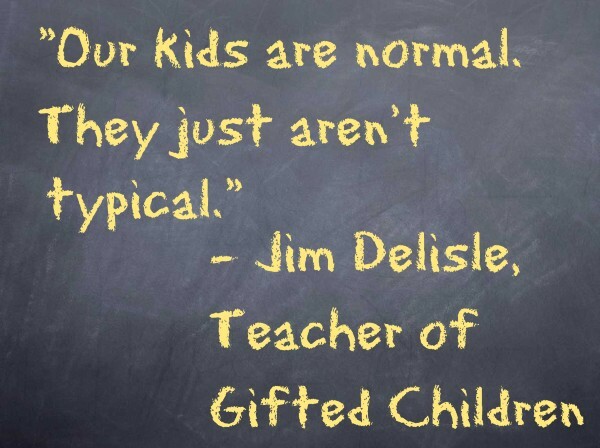 Unfortunately, most parents have no education, formal or informal, in giftedness. They usually view their children’s growth as typical for their age and have little experience to go on. Stephanie Tolan, an author of books on gifted children, did not initially recognize that her son was gifted. Often parents rely on teachers to let them know if their child is ahead or behind, gifted or struggling. While teachers have important experience with larger numbers of children, most teachers have never had a college class or professional development focused on gifted children. Their level of knowledge and acceptance of giftedness varies greatly. Some reasons your child may not be identified as gifted include teachers believing the numbers of gifted students to be significantly smaller than they actually are, recognizing only the profoundly gifted as gifted, not recognizing the symptoms of an underachieving gifted child, or refusing to label any child as gifted or advanced. Even if your child is identified as gifted, that doesn’t mean his needs will be met. Causes include some teachers do not believe gifted students have different needs than the typical student, believe all students should receive the same education at the same academic level, or do not have the time to dedicate to differentiating curriculum for gifted students. While teachers are in an excellent position to spot giftedness, a parent should not assume that the teacher has the training needed or will inform the parents of their child’s intellectual advancement. Your gifted children rely on you to recognize their giftedness and to advocate for them to get the education they need and deserve in the schools. Take the time to learn their unique characteristics and tailor their learning environment to them. I only started writing 5 years ago, I sure wish I knew these things about myself then. My mom has always said I was at college level for reading and writing, I never believed here though she said tests had proven it. I was notoriously misunderstood in school… I can back all of this up. I’m going on 42 years old, when I dropped out, I did an interview for the Oakland Press I believe around 1986. Even then I told the interviewer I didn’t fit in, the article was published. Reblogged this on Socially Tolerable. Reblogged this on À Dieu soit la gloire. I do not believe this is gifted. From every source we were told that Liam would be bored at school and would have only interest in items that were interesting to him. He would do something once, and if you asked him to repeat it, you were not paying attention. He is extremely intelligent, yet does not always care to take the test with seriousness.